THE WRITING BUDDHA - Opinions | Books | Movies: Stumbled Upon Destiny by Jolsna Rajan (Book Review)!!! Stumbled Upon Destiny by Jolsna Rajan (Book Review)!!! I am done reading another book by Srishti Publication. Some of you might think that I am their official reviewer but I am not. It's a miracle that whenever I pick up a book for a light read, it turns out to be from Srishti Publication. 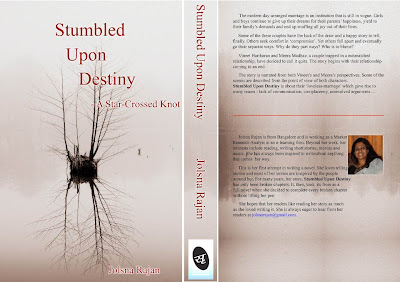 :-) The name of the 177-pages book is "Stumbled Upon Destiny" which also has a tagline "A Star-Crossed Knot" written by a debut authoress, Jolsna Rajan who is from Bangalore and is working as a market Research Analyst in an elearning firm. Beyond her work, her interests include reading, writing short stories, movies and music. This is her first attempt in writing a novel. Surprisingly the modern day arranged marriage institutions still in vogue. Girls and boys continue to give up their dreams for their parents happiness, yield to their family's demands and end up snuffing all joy out of their lives. Some of these couples have the luck of the draw and a happy story to tell, finally. Others seek comfort in compromise. Yet others fall apart and eventually go their separate ways. Why do they part ways? Who is to blame? Vineet Hariharan and Meera Madhav, a couple trapped in a mismatched relationship, have decided to call it quits. The story begins with their relationship coming to an end. The story in narrated from both Vineets and Meeras perspectives, with some scenes described from the point of view of both. 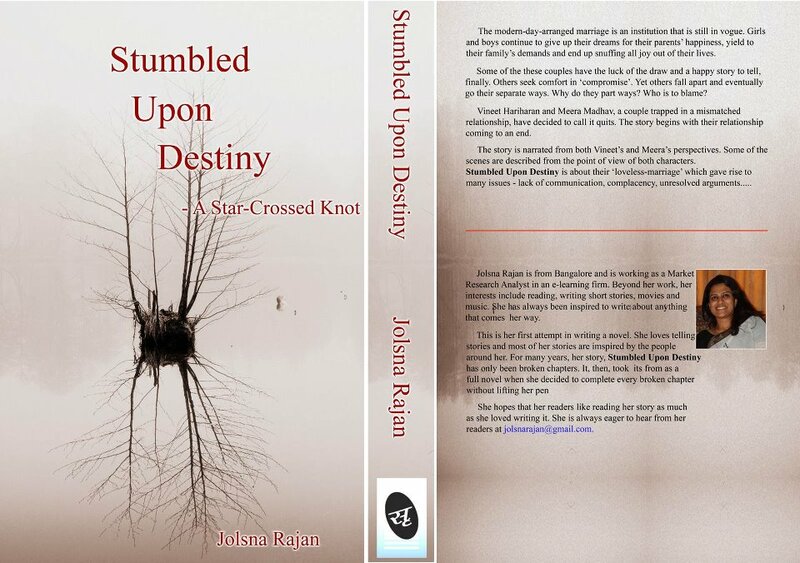 Stumbled Upon Destiny is about their loveless marriage which gives rise to many issue lack of communication, complacency, unresolved arguments..
Coming to the authoress, I would say that Jolsna Rajan has skills that can be sharpened with more writings and experience. Currently, while reading her first work, I found that she was trying to build the book on an interesting line but it didn't happen at every place. She sometimes touched the perfection while sometimes she lost it by a very less margin while sometimes she went totally off-track. The first half of the book wasn't very captivating but the second half was surely catchy. She could have been little more innovative with the part when she tried to narrate the story from the point of view of both the protagonist. 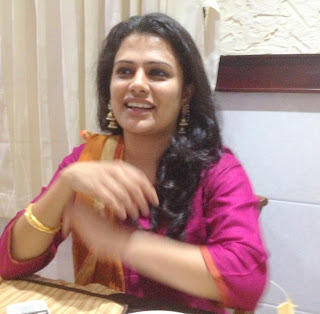 I, personally, feel that after 2 more books by the authoress, we can try putting her under the category of Preeti Shenoy-types but currently, she needs to work little more. The topic on which she has written has been the favorite topic of the married authoresses. :-) The interesting part of the story is that it begins from the point where this couple has already filed for the divorce. The husband- Vineet Hariharan starts as a protagonist initially and tells how his life changes after the divorce has been filed. He also tells how he wanted this to work but his ex-wife, Meera Madhav wasn't interested in giving it a try. The problem is that Vineet speaks as a protagonist for only 36 pages. Better than this, authoress should not have created this part at all. Meera's speaking as a protagonist right from the first page would have been better. There's already nothing special in first 36 pages. When Meera's part begins, initially, its too cheesy and suddenly I started feeling that the first 36 pages were fine. But, right from the Page No. 98th to the last page of the book i.e. 177th, book goes to a very superior stage where you find the maturity that the writer has. She just wanted her best to be displayed in the second half of the book. I just wanted to ask author personally during that part as to why didn't she start the book with the same maturity and energy. :-) From 98th page, the story is about what happened post-marriage that lead to the conditions where both of them had to part ways. The incompatibility shown between both the characters makes us think about why is it going wrong between them when both are a good character. I also liked the part when one of the protagonist realizes the mistakes that he/she has kept committing and apologizes on his/her behalf. I also liked the meetings that are being shown of both the characters in pre-climax and before that too in post-divorce scenarios. I liked the Meera's character a lot in the end. And Vineet is equally highlighted. When the book started, I never knew how authoress is going to build the whole story around such plot and where the climax would intersect but it is beautifully done. The parts where the condition of parents of both the protagonist is described is also done sensibly. Meera's mother's conversation with her in the pre-climax is another beautiful piece. In all, the authoress has beautifully displayed the life that both- husband and wife goes through when they take a mutual decision such as of divorce even when they don't have any better specific reason for it except that they are totally different personality. Author has shown how things can be managed even if there are two different personalities getting into a marriage if one learns to accept mistake, apologize and correct it. I would give the 1-97 pages of the book- 1.5/5 and 98-177 pages, 3.75/5. In all, I would say an okay attempt with 3 out of 5 ratings.